My apologies for running late with Snarky Friday. But at least I am still running. So much for Bevo being the cash cow. 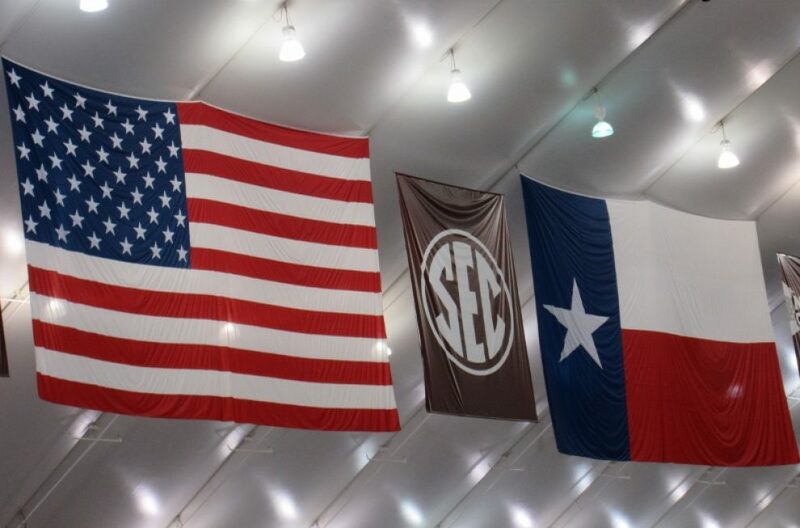 The 148 million average annual revenue of Texas A&M is the largest in the nation. If you live anywhere but Austin, the media states that THE University of Texas’ annual revenue of 133 million, is a “distance second.” If you live in Austin, the media states it is a “close second.” It must some kind of new math they teach in Austin. Speaking of increasing revenue, the Aggies will increase the revenue and warm up Saturday night against University of Louisiana Monroe. FYI – for those of you unfamiliar with the state of Louisiana Monroe is a fancy place in North Louisiana. If I understand correctly, do not confuse Monroe with West Monroe. One is fancier than the other. THE University of Texas will have fond memories of USC from 2005, but that will be all the Horns will have. They kickoff at 7:00 on Fox. While there are games at 11:00 they fall into the “I do not care category.” The real games are in the afternoon. Let’s start at 2:30 on CBS where we find the Tigers of LSU against the Tigers of Auburn. Geaux Tigers. LSU has a real tiger while Auburn is named for a hair color and has an anthropomorphic tiger. Also at 2:30 on ESPN we have the Oklahoma State Cowboys against the Broncos of Boise State. If this game is on that blue field with the OSU orange it will be color blinding and nauseating. Go Pokes. Baylor gets to play Duke on FS1 at 2:30. Did you know that the Duke mascot of Blue Devils is a result of a vote in 1923 partly to anger the Baptists of Wake Forest? Sic ‘Em Bears! At 3:15 on Fox with lots of red colors, Major Applewhite takes his University of Houston Cougars team against Kliff Kingsbury’s Texas Tech Raiders. Go Shasta. For their BCS Rose Bowl Victory – Little Sisters of the Poor. And last, but in no way least, at 6:00 on ESPN the Rebels of Ole Miss go up against The Tide of Alabama. While the Tide will roll, the Rebels could provide some grief. Therefore, I am awarding a Potential Poopy Undies to the Bama Fans. This is not for a loss, but for plays that will scare you. Hotty Toddy! I wonder who the Aggies play next week. This entry was posted in Alabama, Coach Nick Saban, College Football, college football, Education, humor, Jimbo Fisher, LSU, Misc., Native Texan, Texas Aggies. Bookmark the permalink.